I taught the first online learning course at the University of Washington in 1995. My co-instructor was Dr. Norm Coombs, who was, at the time, a professor at the Rochester Institute of Technology. We designed the course to be accessible to anyone, including students who were blind, deaf, or had physical disabilities. Norm himself is blind. He uses a screen reader and speech synthesizer to read text presented on the screen. We employed the latest technology of the time—email, discussion list, Gopher, file transfer protocol, and telnet. All online materials were in a text-based format, and videos, which were mailed to the students, were presented in VHS format with captions and audio description. When asked if any of our students in this course had disabilities, we were proud to say that we did not know. No one needed to disclose a disability because all of the course materials and teaching methods were designed to be accessible to everyone. Today the technology is more advanced and there are more options to choose from for teaching an online course, but the basic issues are the same when it comes to accessibility. We need to make sure that the screen readers of students who are blind can access content in a text-based format; that content is accessible by using the keyboard alone since assistive technology can be used to emulate keyboard commands, but not necessarily movement of a mouse; that videos are captioned and audio described; and that content is presented in a clear, consistent format. As they choose content, document formats, and teaching methods, it is important for instructors to remember that potential students may have a wide variety of characteristics. These characteristics may relate to gender, race, ethnicity, culture, marital status, age, communication skills, learning abilities, interests, physical abilities, social skills, sensory abilities, values, learning preferences, socioeconomic status, religious beliefs, etc. But what does “accessible” mean with respect to an online course? According to the Office of Civil Rights “accessible” means that a person with a disability is afforded the opportunity to acquire the same information, engage in the same interactions, and enjoy the same services as a person without a disability in an equally effective and integrated manner, with substantially equivalent ease of use. The person with a disability must be able to obtain the information as fully, equally, and independently as a person without a disability. There are many sources of information about accessible design for online learning—many are presented on DO-IT’s AccessDL website. I have created twenty basic guidelines that I follow as I develop my own online courses. Although they do not cover every potential accessibility issue, they provide a good start. In case others might find them useful, I share them below, along with URLs of resources that provide further explanations. Structure headings (using style features built into the Learning Management System, Word, PowerPoint (PPT), PDFs, etc.) and use built-in designs/layouts (e.g., for PPT slides). Use descriptive wording for hyperlink text (e.g., “DO-IT Knowledge Base” rather than “click here”). Minimize the use of PDFs, especially presented when as an image; make sure the text is accessible by testing to see if you can copy and paste it). Always offer a text based alternative as well. Provide concise alternative text descriptions of content presented within images. Caption or transcribe video and audio content. Assume students have a wide range of technology skills and provide options for gaining the technology skills needed for course participation. Present content in multiple ways (e.g., in a combination of text, video, audio, and/or image format). Address a wide range of language skills as you write content (e.g., spell acronyms, define terms, avoid or define jargon). Make instructions and expectations clear for activities, projects, and assigned reading. Make examples and assignments relevant to learners with a wide variety of interests and backgrounds. Offer outlines and other scaffolding tools to help students learn. Provide adequate opportunities for practice. Allow adequate time for activities, projects, and tests (e.g., give details of project assignments in the syllabus so that students can start working on them early). Provide feedback on project parts and offer corrective opportunities. 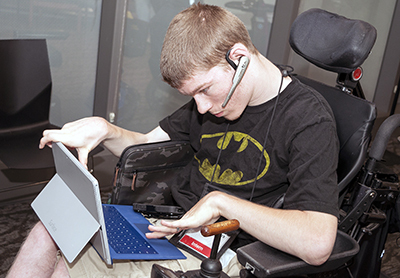 Provide options for communicating and collaborating that are accessible to individuals with a variety of disabilities. Provide options for demonstrating learning (e.g., different types of test items, portfolios, presentations, discussions). how to locate accessibility checkers consult AccessCyberlearning, AccessDL, the Center for Universal Design in Education, and the book Universal Design in Higher Education: From Principles to Practice. A video, 20 Tips for Instructors about Making Online Learning Courses Accessible, may be freely viewed online. Permission is granted to reproduce DO-IT videos for educational, non-commercial purposes as long as the source is acknowledged. DO-IT (Disabilities, Opportunities, Internetworking, and Technology) serves to increase the successful participation of individuals with disabilities in postsecondary education and careers. Funding for DO-IT’s AccessCyberlearning project comes from the NSF as part of the Cyberlearning and Future Learning Technologies program of the Division of Information & Intelligent Systems (Grant #1550477). Any questions, findings, and conclusions or recommendations expressed in this publication are those of the author and do not necessarily reflect the views of the NSF. Copyright © 2018, 2015, University of Washington. Permission is granted to copy these materials for educational, noncommercial purposes provided the source is acknowledged.